No matter how much driving experience you have, or what kind of weather you’re driving in, you should always remember this simple rule of thumb: Never drive faster than what is safe for the current conditions of the road. Keeping that in mind, here are a few helpful hints for driving in less than desirable weather conditions. Do NOT use your high-beam headlights! Doing so will reflect light off the fog ahead of you, making it even harder to see. Instead, turn on your regular headlights, or, your fog lights, if you have them. Use the white line on the right side of the road. This will help guide you and keep you in your lane. It will also prevent your vision from being impaired by the headlights of oncoming traffic. Maintain a significant distance between you and the car in front of you. Give yourself plenty of time to stop abruptly, if necessary. Use your turn signals early. Give cars behind you plenty of notice that you’ll be slowing down to make a turn. When driving in rain, good windshield wipers can be your best friend! If your windshield wipers are old and dull, they can really limit visibility, increasing your risk of getting into an accident. Give yourself plenty of time to stop. It takes longer to stop when driving in wet weather and the roads can be slick. You should also keep a good distance between you and the car in front of you – having to slam on your brakes can result in skidding. Turn on your headlights. They’ll not only help you see, but will make sure you’re visible to other drivers. Drive in the middle lanes. Water is more likely to pool on the outer edges of the road. Try and avoid puddles. Driving over puddles of water can cause your car to hydroplane out of control. It’s helpful to drive in the tracks of the car in front of you. One of the most important things to remember when driving in snow is this: It’s probably going to take you twice as long to get where you’re going, so make sure you allow yourself plenty of time. The last thing you want to be doing is speeding on icy roads to get to your destination on time! Test out your brakes. Your car will perform differently in the snow than it would on a dry road. If you’re new to snow driving, it’s probably a good idea to practice braking in an empty parking lot so you can see how your car reacts to the amount of pressure you apply to the brake pedal. Take corners slowly. Give yourself plenty of time to slow down before turning. Taking a corner with too much speed can cause you to lose control of your vehicle. Accelerate gradually. Your tires are likely to spin in place if you try to accelerate too quickly. Beware of black ice! Black ice – a thin layer of transparent ice on a roadway – can cause your car to spin out and you can quickly lose control. 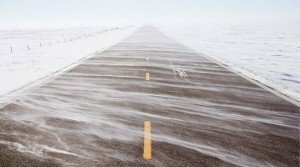 Watch the road ahead of you, and try to avoid driving over areas that look slick.